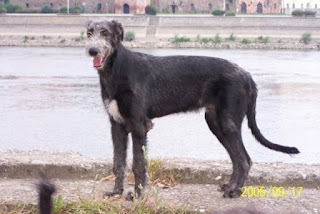 The Irish Dane is a hybrid that is a cross-breed of a Irish Wolfhound and Great Dane and may demonstrate any combination of traits from those two breeds. Hybrids have become very popular in the past few years. They play a big role in the current designer dog trend. The experimentation of these hybrid or designer dogs has not been recognized by the American Kennel Club or Canadian Kennel Club. The key to cross breeding to purebred dogs is what is called hybrid vigor, the breeding resulting in a healthier dog with superior genetic constitution can come from dogs purebred for so long that they have common genetic disorders. Irish Danes are imposing animals with big hearts – literally and figuratively. They are sweet and social creatures with a great appreciation for companionship. They do like to stay active and will seek out opportunities to gallop in open spaces. Irish Danes have a life span of 6 to 10 years and can weigh up to 150 pounds. When they are full grown, they can be anywhere between 30 and 35 inches tall. Irish Danes have a harsh, rough, short to medium coat that comes in solid or multi-color combinations of black, white, blue, fawn, silver, gray, red, and cream. They can have various pattern and markings on their coat as well. In terms of large designer breeds, this one fairly established. 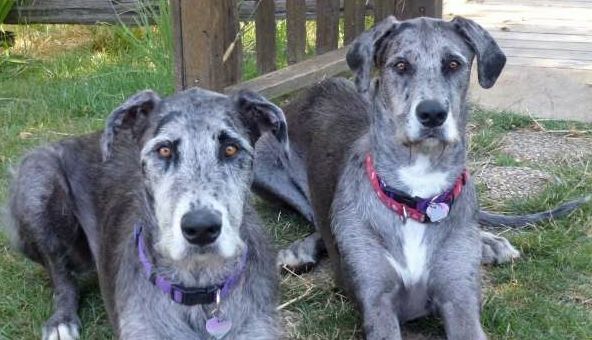 Even so, Irish Danes can vary widely in appearance and temperament. Accordingly, they are not yet recognized by the American Kennel Club (AKC). As a hybrid dog the Irish Dane can have any combination of traits and appearances from either parent, the Irish Wolfhound and Great Dane. Hybrids have had a recent surge of popularity in the last twenty years or so, also known as designer dogs. It has caused a huge variation in prices for such dogs and many puppy mills and disreputable breeders are taking advantage of this trend. Therefore be careful from whom you buy. Unlike many designer dogs the Irish Dane actually does have more of a history to them as they were first bred in the 1800s during an attempt to save the Irish Wolfhound. Though the Irish Dane has an imposing presence, it is anything but scary. Irish Danes are friendly and gentle dogs that love being around others. They will never pass up an opportunity to cuddle and play. Because they are quite social, Irish Danes also do well in multi-pet households. In fact, this breed is prone to separation anxiety if it does not receive enough attention and affection from those around it. The best way to overcome this is to ensure Irish Danes are surrounded by loving people and have a relatively consistent schedule. 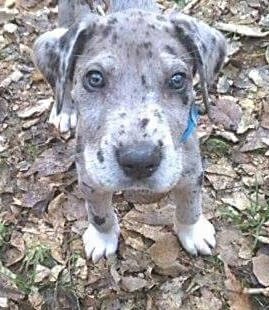 Beyond this, the Irish Dane inherits a strong hunting impulse and guard dog mentality from its parent breeds. This can make it territorial and weary of strange adults at first. Owners can combat any negative behaviors from these instincts by socializing their Irish Danes early and consistently. Nonetheless, this breed is not known to be aggressive and can be a great family dog in the right environment. The best way to ensure you have a healthy dog is to buy from a good breeder and ask to see health clearances for both parents. While there is some argument to hybrid vigor there is a chance in any dog of inheriting the conditions their parents are prone to. In the Irish Dane's case these conditions to be aware of include Development Issues, cancer , bloat, heart problems, surgical issues, Anesthesia Sensitivity, liver problems, Fibrocartilaginous Embolic Myelopathy, OCD, eye problems and joint dysplasia. Irish Danes are relatively easy to maintain and do not require heavy grooming. This breed will shed moderately, however, and is not hypoallergenic or suitable for owner with allergies. If your Irish Dane has a particularly long coat, it may benefit from occasional brushing. Either way, Irish Danes only need occasional baths. They should also have their teeth cleaned on a daily basis. Beyond this, Irish Danes should have their nails clipped at least once or twice a month to avoid split or cracked nails and ears clean regularly with a damp cloth to avoid wax build up and infection. He should be easy to train as he is eager to please and listens to commands and is inclined to obey. 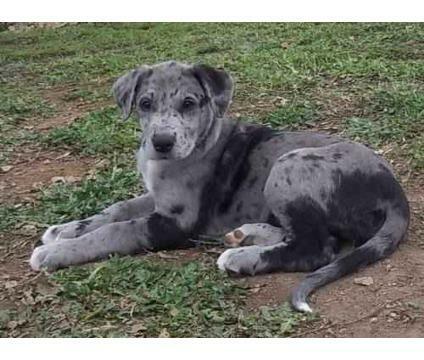 In general the Irish Dane will need fewer repetitions than many other dogs so will train quicker. Because of his size it is important to train him in good behavior from a young age when on the leash, as he will be super powerful when he is an adult and you do not want him pulling at you then. Also teach him not to jump up at people. Establish yourself as pack leader and use positive but firm methods of training. Early socialization and training are very important to get a well rounded dog. Irish Danes have above average levels of energy. They enjoy being active and require quite a bit of daily exercise. This breed loves running and galloping in open spaces, as well as playing with other people and large animals. Owners should aim to provide their Irish Dane with this type of activity about 45 to 90 minutes each day. 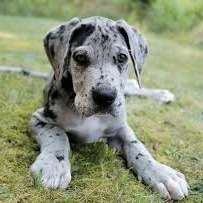 Beyond this, Irish Dane also like to cuddle with family members and lay around the house. This breed is suited for all types of environments, though it should not be over exercised in extreme hot or cold conditions. Additionally, Irish Danes are not suited for apartment, urban, or suburban living due to their large size. They do best in larger homes with lots of outdoor space. The Irish Dane is a low shedding dog and grooming him is quite easy to do. If he has a coat more like the Irish Wolfhound you may need to have it clipped occasionally. Bathe him as he needs it, it is a good idea to train him for this from a young age, as when he is full sized you will not be lifting him in and out of the bath. You could also opt to use the hose in the yard or use a bathing station at a groomers. Make sure you use a dog shampoo. Once a week you need to check his ears and wipe them clean. His teeth should be brushed at least three times a week. His nails may need clipping if he does not naturally keep them worn down. He is good with children as he has a gentle nature. His size does mean he may knock over small children without meaning too so they may need to be watched. Children should also be taught how to play with him and that things like pulling ears, trying to ride him and messing with his food are not things that are acceptable to do. Irish Danes are also good with other pets if they have been socialized though they can see smaller animals as prey to chase. Is the Irish Dane the Right Breed for you? Easy Training: The Irish Dane is known to listen to commands and obey its owner. Expect fewer repetitions when training this breed.